Listen to everyday conversations recorded by native British English speakers in our LearnEnglish Podcasts series, and improve listening skills. Listen to podcast hosts Tess, Ravi, Adam and Jo chatting with different people and talking about different everyday topics, such as their favourite celebrities, making plans for the weekend, having a dinner party and which cities they like to live in. The app helps you learn everyday English by providing 60 episodes and over 20 hours of free listening about a wide range of topics, as well as great new features that help you listen and understand the conversations. In every episode, listen and read along with a moving audioscript. The audioscript gets highlighted to help you focus on listening. Comprehension questions come with each episode so that you can check your listening and whether you understand the conversation. The best way to improve your listening skills is to listen to a little bit every day and try to listen to a wide range of different topics in English. When you’re listening, try to remember or write down as many of the main points as possible. The audio plays even when the screen is turned off. This is a popular request from our users – thank you all for your feedback. - delete episodes after you’ve listened to them to create space on your tablet or phone. Re-download episodes when you want to listen again. We love to hear from our users! If you have any feature requests, feedback or need technical support, get in touch with us through the Feedback and Support button in the Help screen in the app. Learn English in our classrooms with the world’s English experts. We’ve been teaching English for more than 75 years and have helped more than 100 million people in 100 different countries improve their English skills and build their confidence. Visit www.britishcouncil.org/english to find out more information. The British Council creates top English learning apps for learners of all ages. 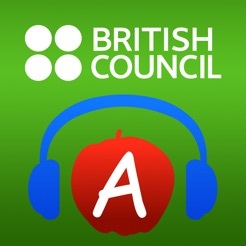 You can download our apps to practise grammar, vocabulary and listening. Visit our website to see all our apps www.britishcouncil.org/mobilelearning. * We've fixed a bug that was causing the app to crash after launch. Thanks for all your patience while we've been fixing this problem! If you have any feedback for us about the app, please get in touch at learnenglish.mobile@britishcouncil.org, and we'll get back to you as soon as we can. This app is very useful for improving English language. But to report for immediate concern, the app has been crashing immediately after opening due to appearance of too many ads. I tried several times reinstalling the app to overcome this issue. Kindly fix this issue. Great job. This app is amazing for learning English! I'm really recommend you, if you need to improve your English this is the app!